We were originally supposed to go to Nairobi and then onto the Masai Mara Reserve in Kenya but what can only be described as post-election civil war within Kenya meant a late change of plans. We landed at Kilimanjaro International Airport in Tanzania (as opposed to Nairobi) and all passengers visited various game lodges within Tanzania. We were delighted with our destination - Migration Camp, which is located on the banks of the Grumeti River, raised up on the side of an impressive kopje known as "Poacher's Lookout" in the Serengeti National Park. "Serengeti" means "endless plains" in Swahili and it is an apt name for this national park. On this occasion, the actual game viewing was certainly not as good as we've experienced on previous trips (vis a vis limited variety of game sighted during our stay and what game we did see seemed to be particularly shy. Put it this way I've never seen so many animals' arses in my entire life!). But every cloud has a silver lining and this was the first time we have stayed in what could reasonably be classified as a semi-luxury safari tent lodge. Food and accommodation were excellent. Each tent has its own ensuite toilet and shower and is either raised on stilts above the ground or perched on granite boulders. Each tent also has its own guard to ensure you do not receive any unwelcome visitors in the night and at evening meal time your guard escorts you with a flash light safely to the dining platform - a few minutes' walk away. It is an intensely atmospheric experience to sleep in the Serengeti with only a layer of canvas to separate you from the wildlife outside – and here it can be done in complete comfort. Thanks to the General Manager, Sandy and his lovely wife, Brenda for making our stay so special - particularly as Greg celebrated his 60th birthday on our first night at Migration Camp. Greg is still talking about how wonderful his birthday dinner was.....and it was indeed very special. And it would be very remiss of us not to specially acknowledge all the staff at Migration Camp, who were simply fabulous. 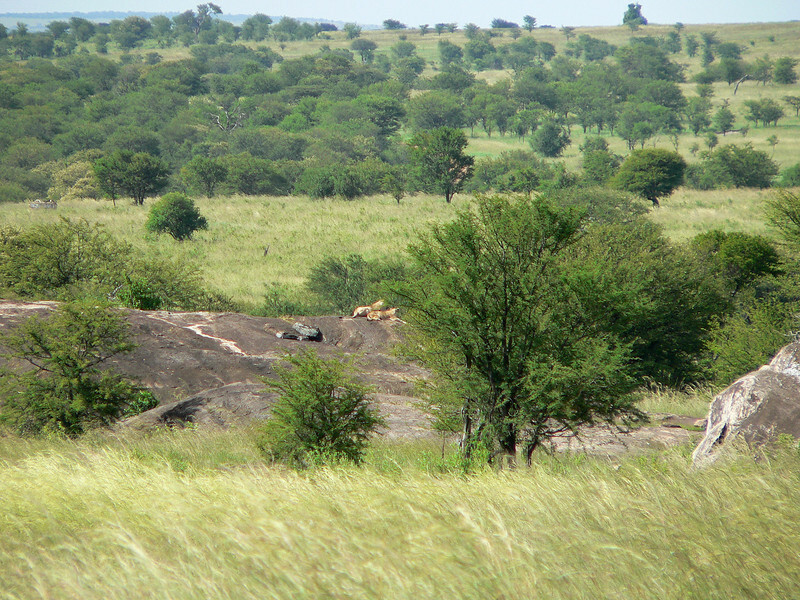 Our first substantial game sighting but sadly, oh so far away.....a couple of lions sitting on the rock. Squint hard and perhaps you'll find them!